Dr. Martin Luther King Jr. waves to the crowd at the National Mall in Washington, DC, August 28, 1963. Photo by Francis Miller. The U.S. recently celebrated the 50-year anniversary of Dr. Martin Luther King Jr.’s “I Have a Dream” speech, originally given on Aug. 28, 1963, in front of approximately 250,000 civil rights supporters from the steps of the Lincoln Memorial during the March on Washington. The speech, of course, pleaded for the end of racism in the United States. The history behind the speech is even greater because it was delivered 100 years after Abraham Lincoln signed the Emancipation Proclamation into law, essentially ending slavery. The fight for freedom for African-Americans was just beginning, and, as King pointed out in his speech, 100 years later, racism was still very much alive. Many would argue that the dream of King has still not been reached today. The controversial outcome of the Trayvon Martin case is just one indication that racism and hatred toward other cultures is still very much an issue in America, especially for certain groups. At City College’s pre-semester Convocation held by administrators and district leaders for the staff and faculty of City College, Dr. Brian King (no relation to Martin Luther King Jr.), the chancellor of the Los Rios Community College District, mentioned that the part of the speech we all remember and love wasn’t fully scripted. 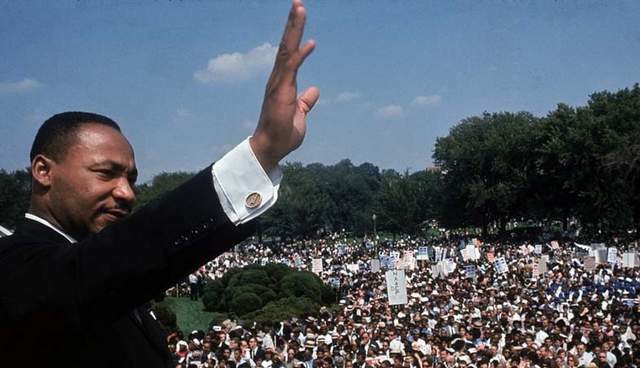 As Brian King pointed out, history shows that Mahalia Jackson, a gospel singer and civil rights activist who attended the historic speech, shouted to MLK Jr., “Tell them about the dream, Martin!” This prompted one of the most historic portions of a speech in the history of the world. While the dream may still not be fully recognized today, and many people fight for it to one day reach its goal, the idea of having a dream has not changed. We all have dreams. Some of us realize those dreams and others fail, but our dreams for the future are one of the many things that bring us together as humans, regardless of age, gender, sexual orientation, background, culture, opinion or race. Every student who sets foot on the City College campus has a dream. Maybe it’s a dream to one day accomplish an ambitious set of goals in a career field in which one has always wanted to work. Maybe it’s a dream to have a family and raise children to be wise, responsible members of society who treat their fellow beings with respect and love. Maybe it’s a dream to make a difference in the world, no matter how big or small. So what’s the dream for City College? Everyone who attends City College wants the school to be a more welcoming, accessible and all-around open environment in which students learn, communicate and become better educated members of society. But how can campus officials and district administrators accomplish such goals? The Express editorial staff has put together a list of five dreams we want to see come true for City College over the course of the next 50 years. This way, on the next anniversary of the “I Have a Dream” speech, we can say that, along with ending racism in the world, City College will be the best community college it can be for our children and our children’s children. …That one day all students who want one will be able to afford a college education, regardless of their financial status, background or circumstances. A system should be in place so that students in the community college level can attend college as they did from kindergarten through high school. More money needs to be allotted to education through taxpayer dollars, fundraising and other methods so that everyone has access to a good higher education. …That books and supplies will be affordable for everyone, too. …That parking, classroom space and class size will not be an issue. We should allow for as many students as the college can handle, and if we have more, space should be made for more. The opposite should also be true: If a class has low enrollment, it should not be canceled. Students shouldn’t have to suffer because of an arbitrary number on a chart. …That opportunities for distance education and technological advances in the classroom aren’t limited by what the college can afford. These programs and advances should be made available to all students so that everyone has an equal chance at education. …And finally that all students can gain a quality education regardless of their learning levels, ethnic backgrounds or mental and physical abilities. The Student Success Scorecard shows a very clear difference in success rates for students of different ages, ethnicities and preparedness. All students should be prepared by the K-12 system to take on college. All students should be able to receive the same education regardless of age or background. These goals may take a lot of time, money and effort to accomplish, but the ability and the potential to achieve these dreams is in us all. City College and Los Rios can make this dream a reality. Next to civil rights and the equal rights of humans, access to an affordable education should be guaranteed to all people. Our dream is that education stops being the first thing to get cut when state and federal governments are low on funds. Our dream is that one day this nation will rise up and treat everyone equally in all facets of life. This entry was posted in Editorial, Sac City Express (SCC) and tagged anniversary, City College, dr martin luther, education, I have a dream, los rios community college district, Martin Luther King Jr., MLK, politics, Sac City Express (SCC), speech. Bookmark the permalink.